Microsclerotherapy is a walk-in/walk-out procedure for the treatment of spider veins (telangiectases) and their slightly larger feeder veins (reticular veins). Microsclerotherapy may be combined with 'ultrasound-guided' sclerotherapy to target underlying varicose veins. The treatment cannot be performed during pregnancy. You will be fitted with a full-length class II compression stocking at the time of the procedure. If you already have this type of stocking, remember to bring it with you on the day of treatment. Warm clothes should be worn on the day of the procedure to help dilate the veins. A tracksuit is ideal, as the loose-fitting tracksuit pants fit easily over the compression stockings. A brisk walk prior to arrival at the rooms also helps to dilate the veins. On the morning of the procedure, wash your legs with soap in the shower and avoid the use of leg losions or moisturiser for 2 days. Ensure that there is no fake tan on the legs, as this can conceal the location of the deeper veins which are important to target during tretament. The procedure is performed in Mr Milne's rooms and takes between 15 - 60 minutes depending on the number of veins needing injection. No anaesthetic is required. You will lie on a treatment couch during the procedure and a gentle tourniquet will be applied to the leg/s being treated. During microsclerotherapy, Mr Milne will inject a sclerosant solution in to the spider veins and reticular veins using very fine needles with the assistance of LED lighting and loup magnification. If ultrasound-guided sclerotherapy is performed at the same time, an ultrasonographer will assist Mr Milne with guiding the needles in to larger varicose veins for injection of the sclerosant. The sclerosant (Aethoxysclerol/polidocanol) acts to damage the lining of the diseased veins, causing them to collapse and clot off. An inflammatory reaction ensues which absorbs the vein over months. Multiple injections will be required for each leg, the exact number depending on the extent of disease. It is normal to experience a fine stinging pain from the injections. Multiple cotton wool balls will be taped over the injection sites to help maintain compression of the veins and absorb any ooze. - Microsclerotherapy is the gold-standard treatment for spider veins and reticular veins. However, despite optimal filling of veins with sclerosant during treatment, residual veins may remain at follow up. For optimal results, particularly in patients with widespread spider veins, it is usual to require more than one microsclerotherapy session. - The response to treatment varies from patient to patient and is difficult to predict. Some veins respond to very dilute sclerosant, others require a higher concentration. A very small percentage fail to respond to even the strongest concentration of sclerosant. - After treatment, the spider veins and reticular veins will look worse for about 6 - 8 weeks before they begin to disappear. Be minful of timing with upcoming beach holidays. Larger reticular veins (and varicose veins, if treated with ultrasound-guided sclerotherapy) are expected to become hard, lumpy, and a little tender when pushed on. This is a sign of successful treatment. The veins will gradually soften and be absorbed by the body over time. In about 25% of cases, a degree of light-brown pigmentation occurs along the course of treated veins. This typically fades over time, but can take months. A compression stocking is applied to the whole leg after treatment. This should be worn full-time for 48 hours. You will be asked to walk for 10 - 15 minutes following the procedure before returning home. This clears the deep veins of any residual sclerosant, minimizing the risk of deep vein thrombosis (DVT). Avoid running, cycling, rowing, or any high-intensity leg exercise for 1 week following treatment. After 48 hours, the stocking and cotton wool balls can be removed and the legs washed in the shower with luke warm water. Depending on the case, Mr Milne may also arrange for a follow up ultrasound to be done to check for any evidence of DVT. The compression stocking can be worn during the day for comfort if desired, and removed at night when in bed until day 7. You will be scheduled for a review appointment with Mr Milne after 6 weeks. It is normal for the veins to look worse before getting better. This can take several months. You may travel short distances, under 4 hours, 1 week following the procedure. It is ideal to avoid flights/train/car travel over 4 hours duration for 4 weeks following the procedure. It is important to stay hydrated and walk around the cabin regularly whenever flying. This occurs occasionally, particularly in people predisposed to migraine. It is treated with aspirin, and usually resolves quickly. This occurs with higher doses of sclerosant. It usually resolves within 30 minutes. This is uncommon, but can occur with higher doses of sclerosant or in patients with needle phobias. It is normal to expect some discomfort and bruising overlying the treated veins. It is expected that they will be tender to push on. Larger veins will feel hard and lumpy. This is related to the procedure itself, but also the inflammatory process which consumes the vein over the weeks to months following the procedure. Usually no pain relief is required, but panadol and topical voltaren gel can be used. It is important to stay active during this time. Light-brown staining occurs in about 25% of cases along the course of treated veins. This is related to the iron component of blood being absorbed by the skin. This typically fades over time, but can take months. It is rare to persist beyond 12 months. If this occurs, a course of oral anticoagulation is prescribed with a follow up ultrasound. This is rare, but a small proportion of patients can develop a network of fine new veins around the injection site. The problem is difficult to treat. Some cases will resolve on their own over several months. If the problem persists, an additional session of sclerotherapy can be trialled to target underlying reticular veins, followed by another period of observation over several months. Recurrence rates for the larger varicose veins is ~20% in the first 5 years following treatment. If this occurs, a repeat ultrasound scan can be performed to determine the nature of recurrence and best treatment option. 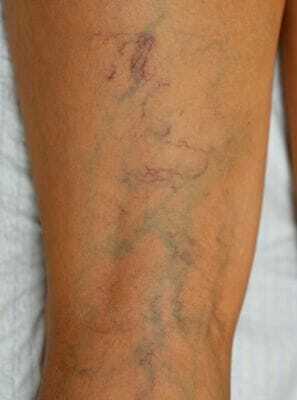 Spider veins have a higher tendency to recur than varicose veins. Recurrent spider veins can be managed with 'top-up' microsclerotherapy sessions.